Writing comes to me in spurts. I hardly ever take the time to just sit and write anymore, and it’s ridiculous. It’s got to change – and soon. What helps me get back in the mood for story-telling is drawing. It isn’t such a stretch because my art has always involved story-telling in one form or another. Here, I’ve done a series of exploratory sketches in the hopes of capturing the frame of mind of a particular character. It’s part of Art Direction to create mood in the moment using framing, composition, lighting, color, etc. In this case I wanted each mini scenario to reflect the state of mind of the character through some rough studies. Art Directors in film, also known as Production Designers use similar techniques to help the Director of the film capture particular moods in a scene. One of my favorite examples in feature film Production Design is Richard Sylbert’s work in 1982 film ‘Frances’ starring Jessica Lange. The story followed early Hollywood actress Frances Farmer through her mental deterioration, Sylbert employed his use of color to depict her frame of mind ingeniously. 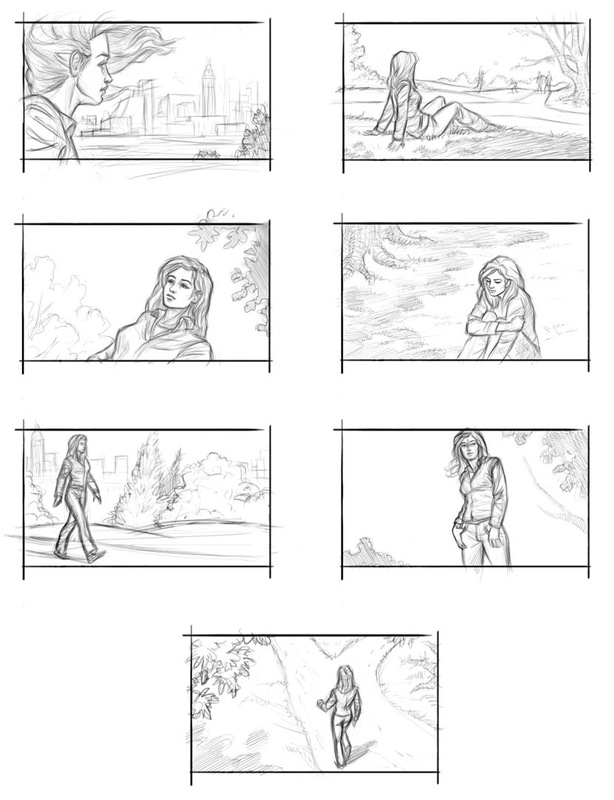 In my sketches, I experimented with framing, composition and body language. See what, if any, insight to her mood or personality comes across from these drawings – it would be a great exercise for me and hopefully a bit of fun for you. And maybe – just maybe I’ll finish writing the stories I’ve already started. Thanks for sharing all this wonderful information. I visit here regularly for the great close-to-life illustrations. You’re very welcome, funkfan. It’s exciting to know that you’re a regular visitor!